Savory cakes,anyone?? This was the first time I tried a savory cake,just wished to cut down the sugar intake in our daily menu and was craving for some dhokla,and am happy that I ended making this one. 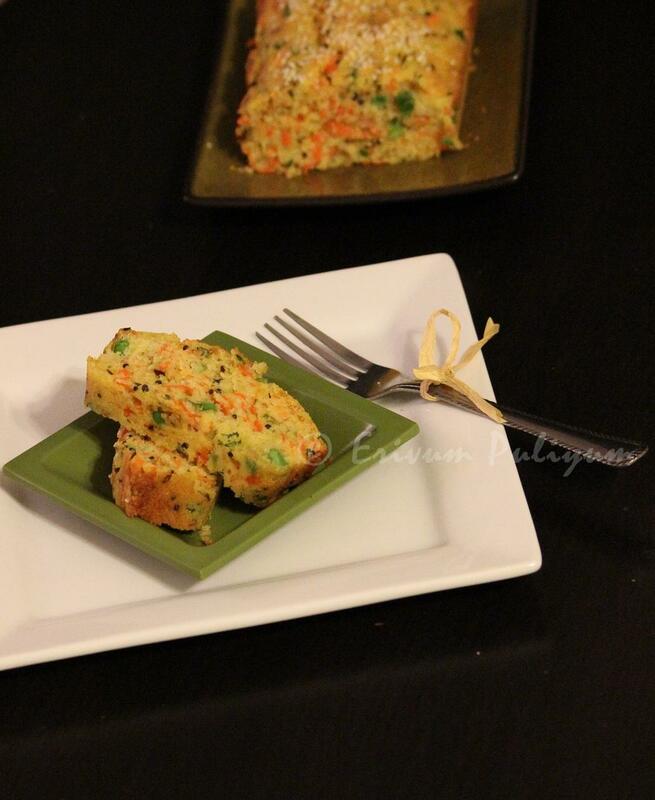 This happened to be the best healthy cake.There is no fat,no sugar and it tastes similar to our Indian savory cake,'Dhokla' as it has the spice flavors similar in that.You can sneak in your veggies and the cake is soft and filling.Enjoy making this cake at home,perfect for diabetics too!! Heat oil in a pan ,splutter mustard seeds,cumin seeds and sesame seeds.Put off flame and let it cool. Combine the semolina,salt,sugar,yogurt.Mix well,add the grated carrot,peas,grated ginger,chopped cilantro,chopped fine green chillies.Combine and add the tempering,mix well. Preheat oven to 350 degrees F and line a bread loaf pan with parchment paper.Spray the sides with oil/butter. Add the baking soda in the batter,mix well and immediately pour in the bread loaf pan lined with parchment paper. Place in the oven and bake for 27-30 minutes.Mine was done at 28 mins. Cool on wire rack and serve warm with ketchup or just like that !! * The spices can be modified as per each one's taste buds. * You can also add your desired veggies. * Adding sugar is optional,balances the salty flavor slightly. * Add baking soda just before pouring it in the pan,otherwise the cake may not rise well. Looks colorful and nice...have seen this earlier on another friends blog, its on my must try list! not bad at all. love it for braekfast. dhokla with chutney ...... yum. your version of savory cake look equally yum. will try this for sure. loved the addition of veggies. One yum savory cake, i love to have this with tea..
hi first time here...yours is a wonderful space with soooo many dishes..happy to be a part of this grt space..
Wow! Thes look awesome. I am definitely going to try this one. Excellently made samolina cakes. Looks fabulous dear. Savory cake looks spongy and delicious. A good alternative to our regular sugary cakes...yumm! Savoury cakes with some salads,makes a wonderful dinner. i too wanted to try this semolina cake for long time, u have done it so well..looks soft, delicious n colorful...neatly presented! Never thought of using Samolina in cakes.Nice recipe. OMG, I'm a sucker for anything that is healthy!! And if there is no sugar & no fat, then I'm all in. 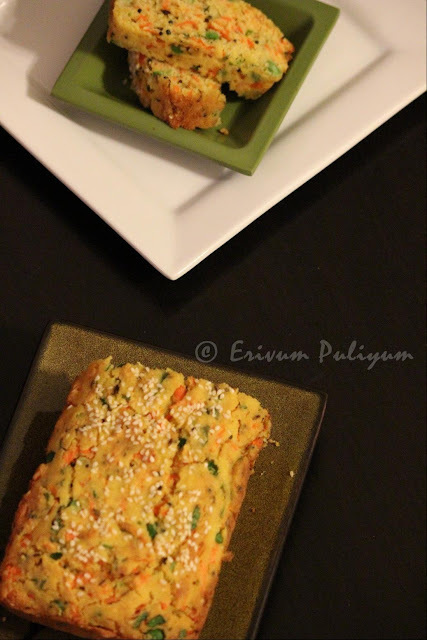 I also love the sesame seed over the Savory cakes. It looks just awesome!! Also it is nice to see there is no need to add Besan in the mixture, still it came out just right. Dhokla is also my favorite, although I cannot eat that everyday because of Besan content!! Wow..the color and texture prove it perfect..Love to have a piece Julie.. So inviting yummy cake..looks very colourful..drooling here on those cake slices. Yummy cake Julie. Love the flavours going in! on my bookmarked list for long!!! pictures are making me drool!! should try these soon! Healthy and nutritious tea time snack or even breakfast. Very colorful and looks perfect.. I've never seen a cake like this...sounds like it would be great with some tea! My family loves this, yours looks beautiful. I made this today & enjoyed it a lot Julie ! 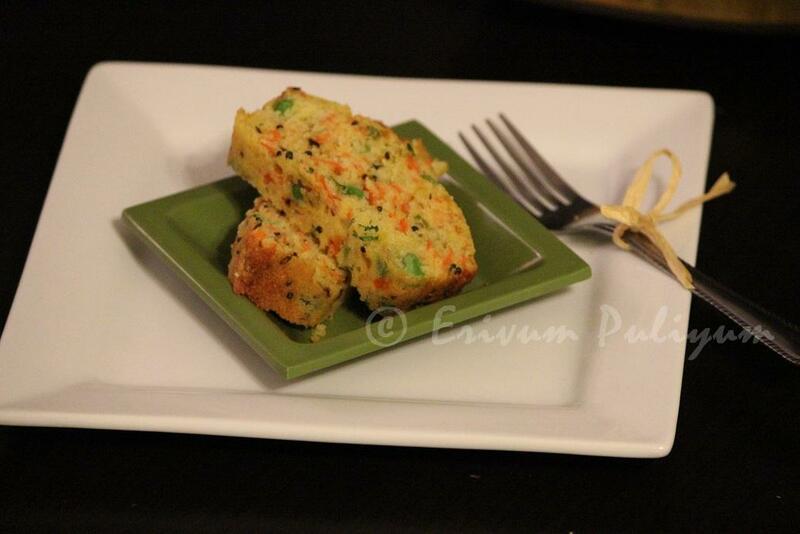 Thanks for sharing.. A great & yummy savory cake..